FILE - U.S. and South Korean army soldiers pose on a floating bridge on the Hantan River in Yeoncheon, South Korea, Dec. 10, 2015. U.S. Secretary of Defense Jim Mattis said he does not believe a reduction of U.S. troop numbers on the Korean Peninsula will be up for discussion when President Donald Trump and North Korean dictator Kim Jong Un meet Tuesday in Singapore. "The U.S. and South Korea are not engaged … in any reduction of U.S. forces talks," Mattis told reporters, adding that U.S. troop levels in South Korea "is not something that other countries would have, I would just say, initial domain over a discussion with us." Pushed about whether U.S. troop numbers would be on the agenda in Singapore, Mattis replied, "I don't believe it is." 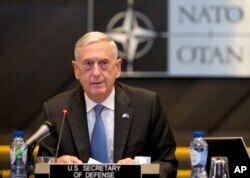 FILE - U.S. Secretary for Defense Jim Mattis addresses a round-table meeting in Brussels, June 8, 2018. Mattis added that discussions about U.S. troop numbers on the peninsula would be "premature" ahead of the outcome of negotiations between the two leaders Tuesday. Trump will meet Tuesday morning with Kim, with only translators present. Secretary of State Mike Pompeo, Chief of Staff John Kelly and National Security Adviser John Bolton will also be involved in bilateral meetings. Mattis is not attending the summit but has one of his assistant secretaries "embedded" there as a military policy adviser. "My job is to find space, to find solutions to support the diplomats," Mattis said. "We're going to have to see what comes out."